Martha Rosler Service: A Trilogy on Colonization Martha Rosler Library Launch of Two Martha Rosler books, with Printed Matter and e-flux Saturday, September 13, 2008, 5:00 – 7:00 PM Printed Matter is pleased to announce the launch of two Martha Rosler publications: Printed Matter's facsimile edition of Service: A Trilogy on Colonization and e-flux's Martha Rosler Library. The launch will take place at Printed Matter on Saturday, Sep­tember 13, 2008. Printed Matter is located at 195 Tenth Avenue at 22nd Street, New York City. 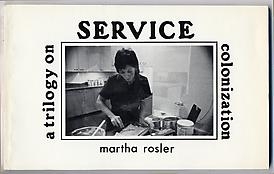 Martha Rosler's Service trilogy was originally published by Printed Matter in 1978, our third year of operation. The publication consists of three short postcard novels that address the social uses of food (with the third told in both English and Spanish). The stories were distributed via postcards typed and mailed every few days by the artist in 1976 before being compiled in this now-rare artist book. Martha Rosler Library was opened to the public by Anton Vidokle in November 2005 as a storefront reading room on Ludlow Street in New York City. Comprising approximately 7,800 titles from the artist's personal collection, the Library has since traveled to Frank­furt, Antwerp, Berlin, Paris, Liverpool, and Edinburgh. Martha Rosler Library, the publica­tion, has been produced to mark the presentation of the project at Site Gallery in Liverpool and Stills in Edinburgh. It includes interviews by Stephen Wright with Martha Rosler and Anton Vidokle about the Library and an essay by Elena Filipovic, which places the Library in the context of the artist's larger body of work. Service: A Trilogy on Colonization is published in an edition of 1050 and retails for $10. The publication is 128 pages and can be purchased at www.printedmatter.org . Martha Rosler Library is 40 pages long with 21 color images and can be purchased here for $14.95 For additional information, please contact AA Bronson, Director, at (212) 925-0325 or at aabronson @ printedmatter.org. Printed Matter, Inc. is an independent 501(c)(3) non-profit organization founded in 1976 by artists and art workers with the mission to foster the appreciation, dissemination, and understanding of artists' books and other artists' publications.